shall reap with shouts of joy. but they sing as they return with the harvest." Gold, and to some extent silver, were hit today in a fairly obvious and expected bear raid. Silver managed to hold its positive close and gold recovered most of the day's decline. The US Dollar did not cooperate and was lower, so making the price declines stick were a bit difficult. Stocks were down sharply during the day, but managed to take back most of their losses into the close. There will be a stock option expiration on Friday. The 850 year old Cathedral of Notre Dame in Paris was devastated by fire today. The queen and I visited it some years ago. 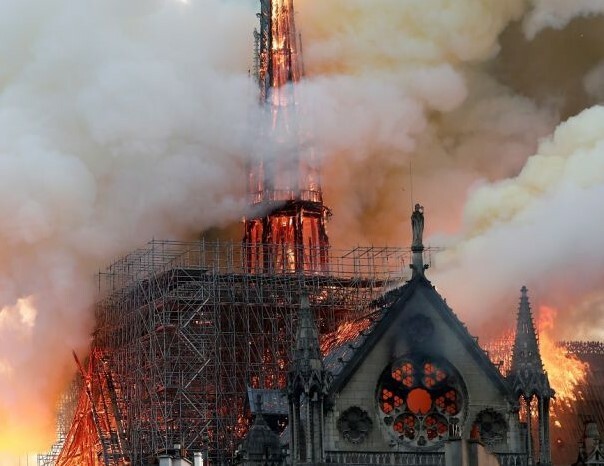 It is sad to see such an iconic and majestic example of religious art and architecture destroyed. My mentor, and my son's godfather, had told me the story of his bicycle trip around Europe when he was a young man during the summer of 1939. He had just graduated from college and was taking some time off. He visited the Île de la Cité of course. While he was there he saw workmen piling sandbags around the beautiful Sainte-Chapelle, the smaller church on the island, which has spectacular stained glass windows. He asked the workmen what they were doing, and the workman replied, "C'est la guerre." He caught the boat back to the States shortly thereafterwards. I picked the quote for this posting yesterday afternoon. I left it, since it seems fitting.